we envision a world where no one has to face homelessness. ample Labs is a non-profit empowering those of us facing homelessness with technology. Do people experiencing homelessness have access to technology? truth: In a survey of 421 homeless adults, 94% said they owned a phone, and these devices are often their most vital tool for communications. Unfortunately, there are not many digital tools directed at people experiencing homelessness. We co-create tech solutions with a community of youth between 16 and 35 that are facing homelessness. We understand everyone comes from a different path. Our partners make a big part of what we do. If you’d like to learn more or become a partner please reach out. 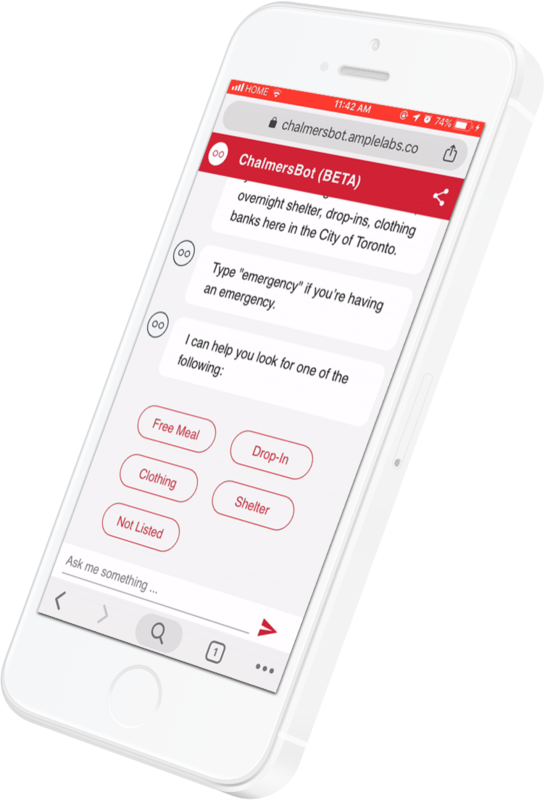 We are a hands-on team of designers, developers, researchers, consultants, and public servants in Toronto who are using technology to empower those experiencing homelessness. Together, we have over 12 years of experience working with those experiencing homelessness, including LGBTQ+ youth. As the director of marketing, you will come up with all of our comms strategies across our channels and products and amplify our mission on them. We are looking for individuals that have a social work background that are interested in helping us conduct secondary research for our products & organization. We are looking for business savvy individuals to help us build relationships and partnerships both within the tech and private sector. We are looking for 2 product managers that will bring to market new products we have in our pipeline. We are always looking for ui/ux designers, ux researchers and developers to continuously improve our existing product and build new products!